Your baby's first year is the most critical period in his or her development. It is a time when bonds are made and learning is happening at a faster rate than it ever will again. Our infant program was established in 1996, and provides for the smallest group setting with a maximum staff ratio of 1 teacher to 4 children. Infants have one primary caregiver. 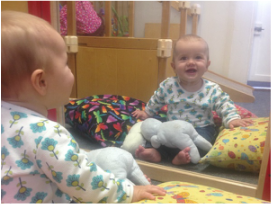 Focus is on developmental milestones, early reading, language acquisition, and individual needs and schedules. Nursing mothers are welcome, and formula is provided through the USDA Child and Adult Care Food Program (CACFP) for those not using breast milk. When the time comes to begin cereal and then fruits, vegetables, and protein we are happy to be a resource for advice, concerns, and questions. Although licensed for 6 weeks old, infants must be 8 weeks old and have had their 2 month immunizations prior to attending. Toddlerhood is such a fun time of exploring, learning, being inquisitive about the environment, toys, and friends. Learning to use language and interact with friends is paramount for one-year olds, while potty training, testing limits, and learning about others are the focus for two-year olds. 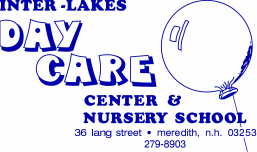 Our toddler program was established in 1992 and provides for small groups of one- and two-year olds, with one group of 5 one-year-olds, and one group of 6 two-year olds. Children learn to share, express their needs using language, explore their environments, adapt to a daily schedule, interact with others, and accomplish potty training. Healthy meals and snacks are included at no additional cost to families.